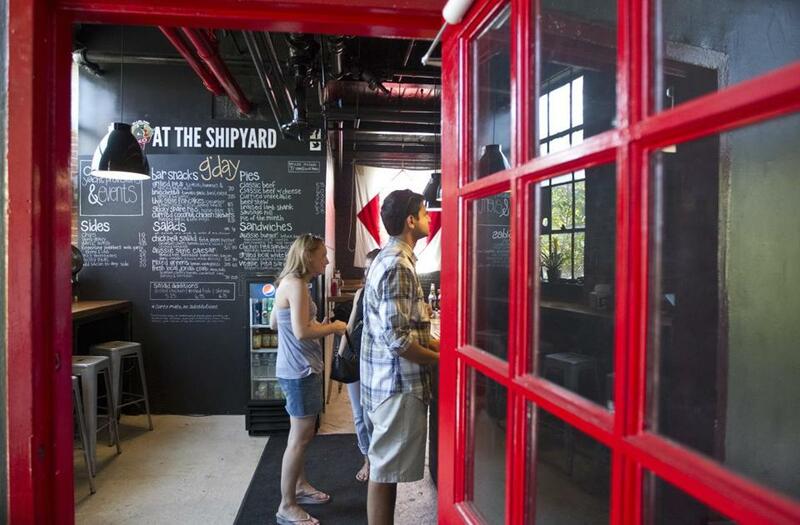 KO at the Shipyard offers a diverse menu, with Aussie pies a highlight. Sam Jackson knows the namesake pastries at KO Catering and Pies in South Boston “put us on the map.” So the chef and co-owner hasn’t shied away from the famed pies of his native Australia at his new East Boston outpost, KO at the Shipyard. He’s simply added some diversity to the entree offerings. After a June 11 soft opening with a bare-bones menu, Jackson and his team began serving expanded options at the new KO on Friday, most notably sandwiches like the Aussie Burger, grilled local whitefish sandwich, and chicken or veggie pitas. The location inside the Boston Harbor Shipyard & Marina near Piers Park is alluring, steps from the water with a brilliant view across to the Edison building in South Boston. KO’s brick structure once housed Scups in the Harbour, with its tiny front patio. KO kept the outside seating with three tables in a gravel lot. Jackson says he’ll soon seat 40 outside to pair with the 28 seats inside. Boats moan as they pass, and on concert nights, music from Bank of America Pavilion floats across the water. The City Water Taxi drops off nearby, and if mentioning KO, riders who get on at Long Wharf or the World Trade Center pay $10 round trip instead of $17. Inside, there’s countertop seating, two long tables, and three high-tops. Clocks tell the time in Sydney, Cape Town, Moscow, South Boston, and “pie time” (current time), or as Jackson says, “any time you walk in is pie time.” Order at the bar from a diverse beer list including local and Australian brews. Appetizers like Thai-style fishcakes ($8.50), served on a bed of mint salad with cucumber, and bruschetta ($7.25), soaked with olive oil and balsamic, arrive quickly and vanish just as fast. Among the new dishes at the East Boston location, chicken pita sandwich ($7.50) stands out, open-faced with gobs of spiced avocado, tomato, and lettuce. The delicate whitefish sandwich ($8.50) sags with shredded iceberg lettuce and a bit too much house-made tartar sauce. Much of the fish falls from the roll and must be scooped up with a plastic fork. Yet the pies are still the knockout punch that gives KO its name. After our first visit, in which we are blown away by the likes of beef stew ($6.25) with shredded meat in red wine and beef stock, curried vegetable ($5.75) with mild heat, and tender braised lamb shank ($6.50), I consult Globe colleague Yvonne Abraham, an Aussie and vocal advocate of KO’s Southie location since it opened in 2010. She excitedly responds that even if she and the restaurant were in Australia, where pies are available practically everywhere, she would still seek out KO. These perfectly firm, golden brown, 5-inch-round pies leave everyone wanting more. For Yanks unfamiliar with pie etiquette, the napkin dispenser displays instructions on how to properly eat the pastries — no forks, all hands. To feel truly Australian, add a sausage roll ($3.75) and lamingtons ($2.75), chocolate-dipped sponge cake with coconut. What a relief. This stuff’s too good to waste.